Buying a new tent for your company can be a bit overwhelming if you’ve never purchased one before.Some of the more frequently asked questions we get are: What different printing methods are available, and how will those print methods affect the cost of my tent/s.Don’t worry – Above All Advertising, Inc. is here to help explain! The three most common print methods which use are: Full Digital Dynamic Adhesion, Screen Print and Full Bleed Dye Sublimation. Let’s look at the details for each option to help you further understand which tent is best suited for your application, artwork and budgetary requirements. Digital Dynamic Adhesion is the more cost effective of our print methods. The best way to describe the print process would be a printed roll of film digitally cut and dynamically applied using heat to transfer the film onto your canopy. Dynamic Adhesion can be imprinted on spot locations on the tent. There are 4 peaks and 4 valances available for printing, and pricing depends on how many locations you want printed. 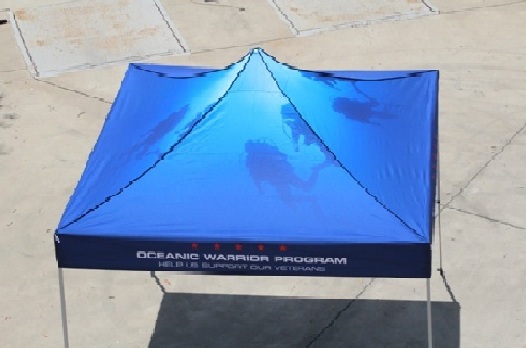 Since this is an application to an existing stock color, we only use this print process on our stock tents. We offer white, black, blue (PMS 286), red (PMS 485), yellow (PMS 116) and green (PMS 348c) for our 5’ x 5’ and 10’ x 10’ tents. White and back are the available colors for our 10’ x 15’ and 10’ x 20’ tents. Screen printing is a cost effective and high quality print method for higher volume orders.The ink is pulled over a screen with a film of your logo cut out on it. If your logo only has a few colors and you will be ordering multiple tents, screen printing might be the best method for you. The screen is prepared once by preparing the ordered logo or text for each print of the logo. For spot color screen print, there is a screen created for every color. The screen and fabric panels are inserted into the template. The color is then applied through the screen onto the fabric. After drying the printed fabric is then sewn together to create the whole canopy of the tent. The print is infused into fabric instead of being applied on top, so the print will not crack, fade or peel under normal use.This print option allows for a much cleaner, higher quality print without being limited to our stock tent color options. You can chose any non-metallic color for the canopy color with the print extending all around the tent. 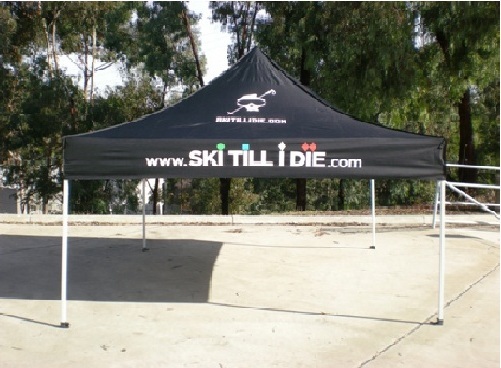 Contact your sales representative for product costs and templates for either one of these tents today!